TeraFlex HD ball joints are engineered to handle the increased load caused by oversized tires and offset wheels. 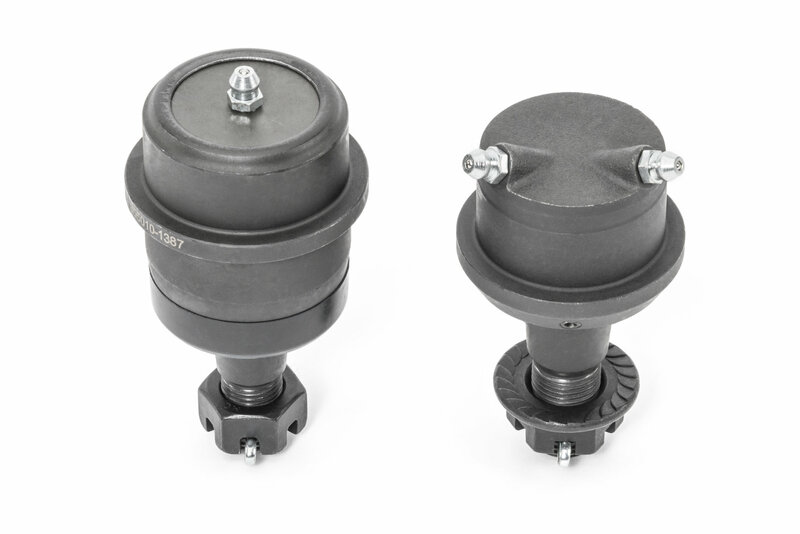 The upper ball joint incorporates hard sintered wear bushings to handle extreme side load demands with out failure and includes an easy top access grease port for simple maintenance. The lower ball joint features adjustable preload when assembled as well as future adjustments. The advanced grease system allows grease servicing to be performed without axle shaft removal, even with larger RCV shafts. Dual machined grease passages in the lower joint housing assembly provides lubrication access without affecting the ball joint load surface. The lower ball joint also eliminates the nylon ball socket wear sleeve that is prone to failure. We recommend ball joints without knurls as they will not score the inner knuckle and open up the bore. We also offer ball joint with knurls for ball joints that have a loose press fit in the inner knuckle due to repeated ball joint replacement or if knurled ball joints have been installed previously. Late 2012 and newer JKs can modify the outer shaft ears to work with these ball joints.